Top recording and mastering engineers still use some analogue signal processing equipment, finding the familiar correlation between sound and control better to work with. However, most analogue equalizers have either continuously variable controls, making precise adjustments difficult, or just a few coarsely-stepped controls. Many fail to meet the standards of audio performance consistent with digital media. The MEA-2 provides fully-stepped controls for precision and repeatability for ALL parameters. The MEA-2 is extensively used in mastering but also works well on an insertion point in recording or mixing. The MEA-2 has stepped controls with a fine 0.5dB gain adjustment at low cut/boost settings. Maximum cut/boost per band is 8dB. The MEA-2 is an equalizer that can provide precise equalization with minimal side-effects - it is designed to provide a very transparent signal path where only the desired equalization effect is obtained without adding any particular sonic signature. The first to appear in the range of Maselec Master Series products, the MEA-2 was developed for Prism Sound by engineer/producer Leif Mases. Leif's work with a diverse range of artists including Abba, Led Zeppelin, Jeff Beck and Black Sabbath as well as co-ownership of the renowned Marcus Studios in London provided the essential experience using the "tools of the trade" needed to define and implement new and improved professional audio components. Also qualified in electronic design, Leif Mases developed the highly acclaimed Maselec 9001 retrofit equalizer for SSL 4000 mixing consoles used in film sound and recording studios and currently also builds custom consoles and equipment for mastering and other applications. The combination of Leif Mases' experience with the creative process and Prism Sound's focus on engineering and technical excellence ensure that the Maselec Master Series delivers great-sounding audio in an intuitive and easy-to-use package. 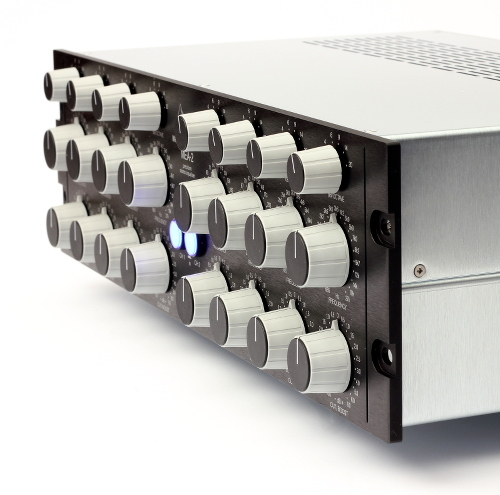 The MEA-2 is a very special Equalizer that has been designed to achieve a certain sound. It has a distinctive character, discernable both sonically and in the unique shape of its EQ curves. With 4 bands per channel, shelving/peaking/Q selection on each and 84 interleaved frequency settings per channel, the MEA-2 provides great flexibility and precision. Each channel can be by-passed individually, indicated by illuminated push buttons on the front panel. The MEA-2 provides the warmth, punch or air you need with a minimum of effort and without compromising the signal path. There's no easy way to describe it though, so contact us now to arrange a demo. Great sounding EQ is right behind the controls! Look at the MEA-2 technical specifications page for detailed technical data or complete our brief enquiry form to ask a question about the MEA-2. To request a demo or to order an MEA-2, please complete our demo/quotation request form. 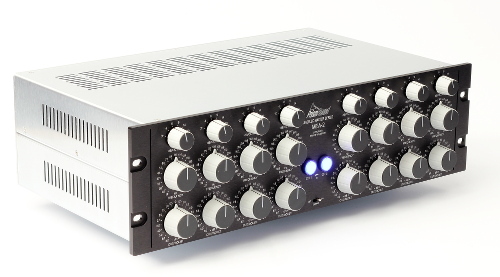 Ideal companions for the MEA-2 are the MLA-2 Compressor, the AD-2 Stereo A/D converter and the DA-2 Stereo D/A converter.